Red Ribbon Dedication Cakes Birthday Budget Planner! I am a Mother of 3 and currently a Stay at Home Mom, I am still waiting to come back to the States to work as a Nurse, I hope it would be early next year because I would really want to work again and earned money because being on a tight budget can be very frustrating and so I am just always looking for ways to budget our money. But here is the great news to moms like me because Red Ribbon Proudly Launches The Birthday Budget Planner, accessible at www.birthdaybudgetplanner.com, It helps budget a party for you. 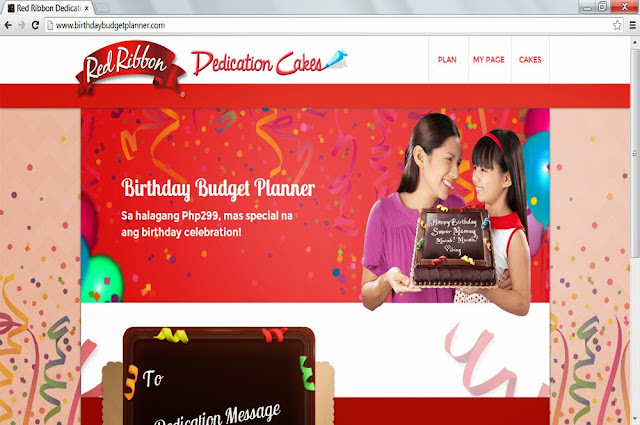 Red Ribbon, one of the country’s most recognizable bakeshop brands, is proud to officially launch the Dedication Cakes Birthday Budget Planner. The Birthday Budget Planner makes celebrations easier and more convenient for all those who love to make parties a little more special without breaking the budget. 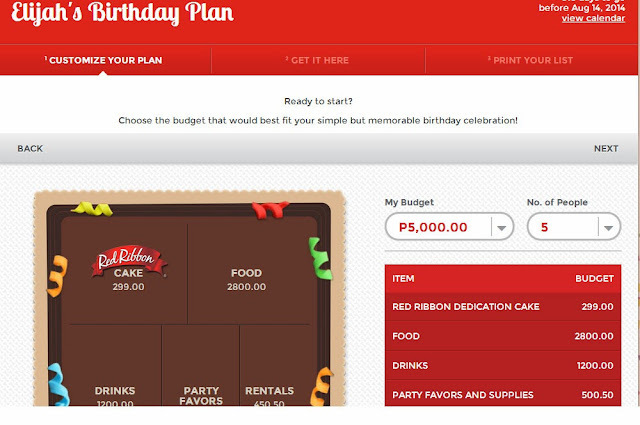 Here's a sample on how to use the Red Ribbon Birthday Budget Planner. It's also mobile-friendly so you access it on your smartphone or tablet! Just Click Connect to Facebook after typing the information to start planning. STEP 2: Type the Name of Celebrant, Put the Birthday and Put your message on the dedication cake that can be personalized with your own special dedication, allowing you to have sweet and short messages on the Red Ribbon Cake. STEP 3: Just put in your budget that would best fit your simple but memorable birthday celebration! You can change each options. The Red Ribbon Party Planner will help you get the most out of your budget! It points you to the right direction to help you get everything you need, from the delicious Red Ribbon Chocolate Dedication Cake 8x8 to the decorations and where to get refreshments for the celebration or party. 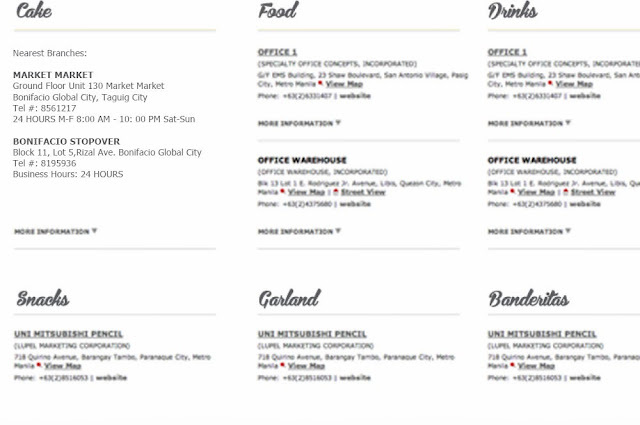 After planning on the website, just print your list of party suppliers and go! Try out the Red Ribbon Dedication Cake Birthday Budget Planner yourself and see just how easy and convenient celebration planning is Red Ribbon! Yes Jocris it would be really nice to be a millionaire and just buy anything we want and not even need. Lol! Money can buy happiness :-) hahahah! Did you already work sa abroad? how is it? I'm also a nurse.. newly RN. I don't have plans pa but I really want to work. 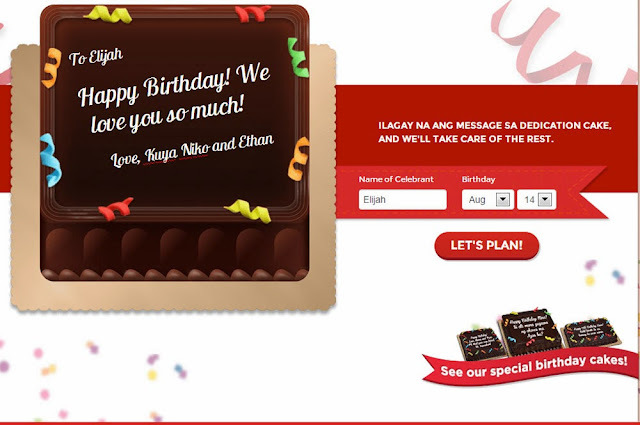 :3 and so that I can try this red ribbon birthday budget planner. ;) it's good. Yes nag work ako sa States and umuwi lang dito to study Nursing. :-) Pero ayoko na bumalik. hahaha! I feel sad Ms. Rochelle na aalis ka d2 sa Pilipinas, I do hope na magblog ka pa rin even your outside the country. Kahit Sad po ako at the same time happy at naiintindihan ko po kau kung bakit naging ganito ang decision po ninyo. Tama po kau, sa panahon ngayon at sa kalagayan natin as a mother kailangan na po nating kumayod at kumita ng pera, lalo na po kung d po sapat sa panga2ilangan ng pamilya ang kinikita ng partner natin. Ganun po kasi ako, kahit mahirap na iwan ang anak ko po, nagwo2rk pa rin po ako para naman po makatulong sa partner ko maghanap ng pera. Well, GOODLUCK nalang Ms. Rochelle sa career ninyo I know makakaya mo yan 'coz you're strong woman. Maganda po ang naisip ng ribbon, at least ngayon alam na natin kung papano mabudget ang cake na affordable at sulit. Wow...going through all your posts... I only heard about this now... this is a definite share material :) Tamang tama, I had been wanting to plan my daughter's birthday and I am still clueless on what I am going to. Good Luck Winnie! Give me your feedback upon using it! thanks for sharing this info ms. rochelle,. makakabili nako ng cake every month pra sa celebration ng baby ko,. ahehehe,. every month kasi pinaghahanda ko sya at madadagdagan n ng cake khit yung maliit lng,. pag-1 year old nlng ska nko bibili ng malaki,. again,. thanks sa info,.